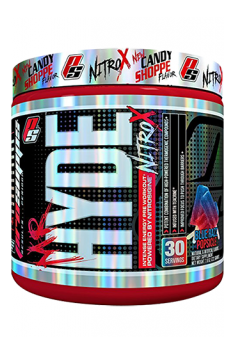 Prosupps Mr Hyde Nitro-X is an advanced pre-workout supplement which increases the body’s physical performance. It boosts nitric oxide production, increases strength and helps maintain adequate levels of focus and motivation during training. The supplement has a high content of caffeine in three different forms and arginine in the patented formula Nitrosigine®. Beta-Alanine – a dipeptide composed of histidine and alanine which acts in the body as a substrate for carnosine synthesis. Carnosine regulates cellular pH levels by functioning as an acceptor of hydrogen ions (H+) that are formed during increased muscle function. In addition, it helps maintain optimal pH levels which are necessary for biochemical processes and delay fatigue, associated with H+ build-up in muscles. Owing to that, beta-alanine boosts the endurance of muscles and is critical to their efficient function during high training loads and inhibits the production of lactate, responsible for a “burning” sensation in muscles. Creatine hydrochloride – is a slightly more stable form of the popular creatine monohydrate, which makes its highly absorbable, even up to 70%. Creatine has strong ergogenic properties because it is used for the resynthesis of adenosine triphosphate (ATP) after its conversion into phosphocreatine. ATP is a high-energy chemical compound which provides energy for many processes in the body, including skeletal muscle contractions. Creatine supplementation is effective in increasing muscle strength and endurance and promotes muscle growth. By boosting energy production, it reduces fatigue and helps you train longer without fatigue. Nitrosigine® – a patented formula of inositol-stabilised arginine silicate. Since it is highly stable, it has good bioavailability. Arginine is converted in the body into nitric oxide (NO), which is a gaseous hormone relaxing blood vessels and improving blood flow. Efficient blood flow helps supply more oxygen and nutrients to muscles, thereby helping them work longer without fatigue. Arginine reduces energy expenditure of physical activity and stimulates post-workout release of growth hormone (GH), promoting muscle recovery and anabolism. What is more, it leads to enhanced blood supply to muscles, known commonly as a “pump”, which makes your muscles bulky and almost every vein visible on your body due to increased blood flow. Compared to other forms of the amino acid, Nitrosigine® is more effective in boosting levels of nitric oxide and makes it last for up to 6 hours. L-Citrulline Aspartate – L-citrulline is an amino acid which, like arginine, is involved in the urea cycle responsible for converting toxic ammonia into urea and excreting it from the body. Taking L-citrulline increases NO levels much more than arginine alone because it is converted by asparagine into arginine and is not deactivated by digestive enzymes. L-Citrulline effectively reduces fatigue and muscle damage, thereby enhancing the body’s physical performance. In addition, it promotes vasodilation, muscle energy production and muscle glycogen resynthesis. Caffeine Matrix – a combination of three sources of caffeine: caffeine anhydrous, malate, and citrate which effectively reduce fatigue and increase energy production in the body. Caffeine is a purine alkaloid which increases energy levels and helps stay focused by regulating hormone and neurotransmitter levels. Since caffeine resembles molecules of adenosine, it may bind to its receptors and blocks its activity in the central nervous system (CNS). As an inhibitory neurotransmitter, adenosine causes fatigue and reduces intellectual capacity. Furthermore, caffeine boosts levels of adrenaline, noradrenaline and dopamine which raise blood pressure and heart rate, promoting cardiac function. As a result, it increases strength, endurance and duration of physical activity without getting tired. In addition, it stimulates the release of fatty acids from adipocytes and promotes their utilisation as a fuel and increases metabolic rate and oxygen use by the body. Choline bitartrate – choline is required for the synthesis of acetylcholine (ACh) – one of the most important neurotransmitters in the body. ACh is responsible for cognitive abilities, helps stay focused and contributes to improving memory. In addition, it binds to nicotinic receptors and thus facilitates the contraction of muscle fibres and is critical to their strength. L-Theanine is a psychoactive amino acid found in green tea leaves. It has similar chemical structure to glutamine and that is why it can bind to GABA receptors and reduce anxiety and stress It has synergistic effects with caffeine andd thus helps maintain focus and motivation. It stimulates endothelial nitric oxide production and improves cerebral blood flow. It has antioxidant potential, protects blood vessels from damage and reduces negative effects of caffeine overdose. N-Acetyl-L-Tyrosine (NALT) – an acetylated form of L-tyrosine which effectively crosses the blood-brain barrier and has major effects on the nervous system. It is necessary for the synthesis of dopamine, adrenaline and noradrenaline. Catecholamines helps maintain high levels of motivation, focus and motor coordination. NALT reduces anxiety in stressful situations and prevents catecholamine depletion when you are under chronic stress or take too much stimulants. Niacin (otherwise known as vitamin B3) – is a substrate for the production of nicotinamide adenine dinucletodide (NADH), involved in many enzymatic reactions in the body. As an acceptor of electrons and protons, it takes part in cellular respiration and ATP production and is critical to normal function of muscles and boosts their efficiency. To sum up, Prosupps Mr Hyde Nitro-X is a multi-ingredient pre-workout stack which helps you increase the body’s performance during physical activity. Synergistic ingredients with proven efficacy will increase muscle strength and endurance. Enhanced nitric oxide production promotes vascularity and muscle pump during training and after finishing your workout due to the patented formula Nitrosigine®. The formulation helps also maintain focus and concentration levels and reduces anxiety after caffeine intake. Mix 1 scoop (7,7 g) with 8 oz of cold water. Consume 15 to 30 minutes before exercise. Since the supplement contains stimulants, it should be taken preferably up to 4 hours before bedtime. During supplementation, do not consume caffeine from other sources. Take the formulation preferably on demand because if you take the supplement regularly, you may build up a tolerance to stimulants and it will not be effective. Natural and Artificial Flavors, Soluble Dietary Fiber, Citric Acid, Sucralose, Calcium Silicate, Silicon Dioxide, Malic Acid, Tartaric Acid, Acesulfame Potassium, Red #40. Highly assimilable form of coenzyme Q10, ubiquinol. Support for mitochondrial function and fatigue reduction. Dietary supplement containing glucosamine. It protects and regenerates joints, heals cartilage microdamages. Nitrosigine (inositol arginine silicate) – an advanced form of the popular amino acid supplemented to get muscle pump. Even though it shows similar effects, it stands out for its potency and duration of action. Nitrosigine belongs to supplements referred to as the body’s nitric oxide boosters. NO helps widen the lumen of blood vessels and thus promotes blood flow in the human body. This leads to increased blood supply to peripheral tissues (mainly skeletal muscles during training), resulting in the so-called muscle pump. This helps maintain high training performance due to enhanced transport of energy substances. NO promotes also post-workout recovery. Inositol arginine silicate features high potency. It goes hand in hand with the duration of action of the supplement in the body. Its effects are noticeable just 15 minutes after oral delivery and last even for 6 hours. This maximises its efficacy. Caffeine malate – a combination of caffeine and malic acid which is thus easily absorbed by the body. It is an organic compound which is likely to stimulate human mental activity and has strong energising properties and that is why it is extremely popular among athletes. Caffeine regulates and maintains healthy blood sugar levels and reduces the incidence of hypoglycaemia. It increases intestinal sugar absorption and can even reduce the demand for glycogen accumulated in muscles, which may contribute to an increase in the body’s endurance. This compound inhibits the activity of adenosine which calms and relaxes the body. It promotes adrenaline secretion and stimulates the activity of the whole central nervous system. Caffeine speeds up the release of fats which may also help increase endurance in athletes as a new available source of energy. It contributes to an increase in focus and delays a feeling of fatigue after physical activity.